Subaru is set to launch a new version of its mid-sized sedan, but the Legacy - or Liberty as it's known here - may not make it to Australia. 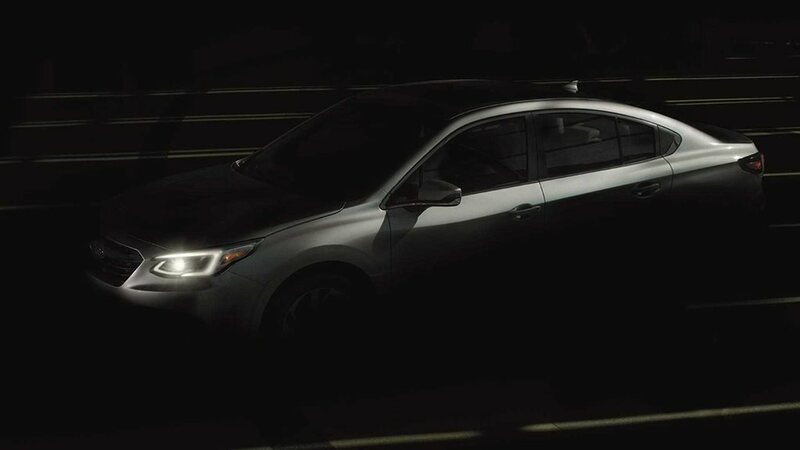 Built on Subaru's new billion-dollar platform that sits underneath cars like the Forester and Impreza, the all-new version of the Legacy will be unveiled at this week's Chicago motor show, before hitting the streets of the US in 2020. Shadowy silhouette teasers reveal a stylish yet conventional five-seat, four-door sedan, with an interior that appears to level up over the ageing previous generation. The huge multimedia screen (below) is a big departure for Subaru, while the treatment of the centre console, in general, looks very premium. There are no other details as yet, but figure on the Legacy/Liberty using an updated version of the current car's 2.5-litre naturally aspirated flat-four petrol engine backed by a CVT gearbox, as well as its all-wheel-drive set-up. Don't, however, expect to see a return of the brand's six-cylinder petrol engine, as it's not designed to marry up with the new platform. However, with sedan sales sliding across the world in favour of SUVs, time might be running out for the Australian-spec Liberty. Its sales figures of the current model, which launched in 2014, are in a solid decline - it sold 74 in January, against a 1630 total for its Forester stablemate. The medium sedan sector itself is off almost 30 per cent over the same time last year, as well. In fact, medium car sales numbers are a sea of red ink, with Ford's Mondeo off 35 per cent year on year, the Kia Optima down 20 per cent and even the mighty Toyota Camry slipping back some 35 per cent. Even the seemingly untouchable Mercedes-Benz C-Class is losing its shine, with sales dipping more than 20 per cent over the last 12 months. "Our current Liberty still has a considerable time to run, and at this stage we have no information about future timelines," said a Subaru spokesperson. Statistics suggest, however, that smaller companies with fewer backroom resources to market poorly performing cars will often turn the stragglers loose. It's not a blanket rule, though; Skoda, for example, says it's backing its next Octavia mid-sized sedan to the hilt as it tries to pick where the top of the SUV popularity curve will peak.